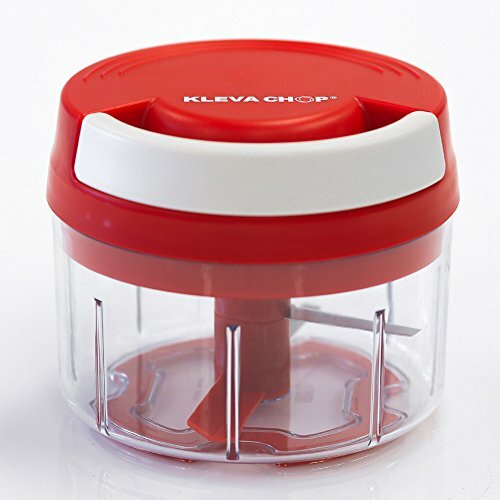 If you hate cutting onions, the smell the tears the time no matter which way you slice or dice then you'll love the all new Kleva Chop Pro - it's the 3 second chopper. You only need to use it once on to see why so many have been sold. 1. Simple to use, Kleva Chop Pro can chop any vegetable in less than 3 seconds. Chop nuts, herbs, fruit and biscuits. Perfect for salads, soups, stews, desserts and so much more. 2. GUARANTEED FOR OVER 5000 PULLS - Featuring a super tough nylon handle making it much quicker than a knife. For a chunky chop just pull and stop pull it twice for a finer slice. The more you pull the more you chop until you stop. 3. Much smaller, quieter and easier than your big bulky blender plus it's just so easy to store. Cleanup's a breeze just rinse it under the tap. 4. New Fixed Blades for a quicker and Cleaner Cut KLEVA CHOP PRO features the NEW fixed blades and it delivers a faster cleaner chop than ever before, leading to faster and cleaner diced ingredients for your favourite dishes. 5. New bottom blade to ensure consistency of cut and less wastage With our new bottom paddle, we ensure consistency of chop across your product, and minimal wastage as the new paddle ensures no sticking or collecting of product on the bottom of your KLEVA CHOP PRO. 6. New tools for the KLEVA CHOP PRO PRO ensuring easy use with Dairy and for Preparing your Dishes. With the inclusion of our Perfect Fit Scraping Wand you have minimal wastage, and with the NEW Whipping Tool you can create fresh dips and milkshakes using the 7 revolutions per a second triple blade turbo action. 30 Day 100% SATISFACTION GUARANTEE. The KLEVA CHOP PRO is the Original KLEVA CHOP PRO developed by the KLEVA RANGE Team. SIMPLE TO USE - You can use it to chop any type of vegetable, nuts, herbs, biscuits and so much more quickly and easily. It has an all new easy grip handle that makes it so easy almost anyone can do it. This feature makes it the ideal chopper for people who are looking for safety in their products - Families, Mothers and Seniors. FEATURING AN EXCLUSIVE 7 TO 1 GEARING SYSTEM - that spins the super tough stainless steel blades seven revolutions in the one spin. If you have any questions about this product by KLEVA RANGE, contact us by completing and submitting the form below. If you are looking for a specif part number, please include it with your message. Fletcher's Mills Vineyard Collection Wood Pepper Mill, Cherry Stain, 7"